M21994 Postponed – This sale has been postponed pending a bulk sale to the Landlord. 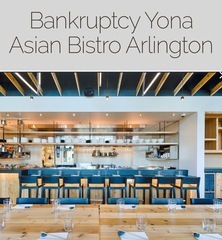 Bankruptcy Liquidation of this Mike Isabella Asian Eatery. Quality furnishings, decor, and equipment. ONLINE NOW! *** Notice **** 4/23/19 This auction has been postponed at the direction of the Bankruptcy Court Pending Notice and Bulk Sale to The Landlord.